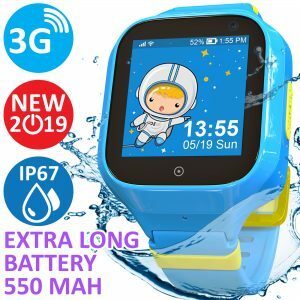 ✔ 3G IP67 WATERPROOF PHONEWATCH is the best valuable 2019 model, helps you to reach your child anytime anywhere by using 2G and 3G data traffic (additional nano SIM card needed, not included). You are able to set the numbers for incoming and outgoing calls(up to 15), voice messages through the application for IOS and Android. 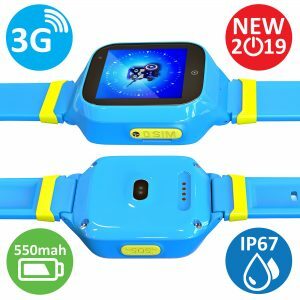 ✔ EXTRA LONG BATTERY 550 Mah and SOS EMERGENCY CALL FEATURE / REMOTE CAMERA & REMOTE VOICE MONITOR for the full safety of your child. When in danger, by pressing the long on the SOS button of the watch, you will receive a SOS message and a call immediately (up to 3 SOS numbers, until someone will answer). ✔ ACCURATE LOCATION PROVIDED BY GPS+LBS+WIFI of your Kids 3G GPS Tracker gives you all the actual information about your kid’s location, reports of the movements around the city. Feel safe. Just open the Map in the application and press “Locate”. 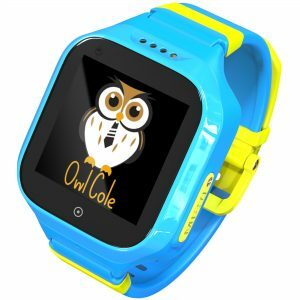 ✔ FUN CAMERA FOR SELFIE AND VIDEO helps your child to take selfies,pictures and videos and send it to you through the app from GPS Smart Watch for Kids Owl Cole. Using the REMOTE CAMERA you can get a picture of what surrounds the kid without his knowing. ✔ DAILY SCHEDULE & ALARM & PEDOMETER. You can set up the daily activities and raise the responsibility of your child. 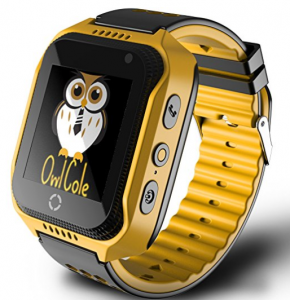 Put up to 3 alarms per day and check on the Steps/Calories spent/Distance on the daily bases with our latest Anti-Lost fitness tracker for kids Owl Cole. * Please add your phone number to the address book with application(up to 15 numbers). As well as the SOS numbers(up to 3). *Perfect for USA and other North America and South America countries. *Would not work in Europe, Asia, Africa or Australia due to WCDMA frequency difference. 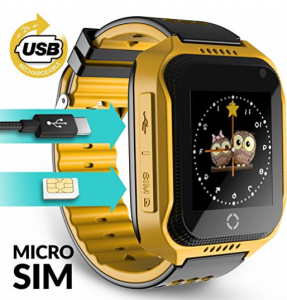 ✔TOUCHSCREEN PHONEWATCH helps you to reach your child anytime anywhere by using 2G data traffic (additional micro SIM card needed, not included). We recommend SPEEDTALK SIM by I-mobile. You are able to set the numbers for incoming and outgoing calls, voice messages through the application for IOS and Android. ✔GPS AND LBS POSITIONING gives you all actual information about your kid’s location, reports of the movements around the city. ✔FUN CAMERA helps your baby to take selfies and pictures. Flashlight may be needed anytime it necessary. *For your convenient use we recommend you to double check if your area supports 2G Network and purchase additional Micro Sim card. We can recommend Speedtalk SIM by T-mobile, which has a $5 plan. 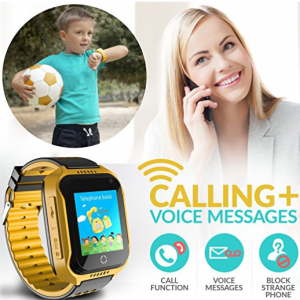 *In order to make and accept calls from the watch you need to add your phone number to the address book through application(up to 10 numbers). As well as the SOS massage numbers(up to 3).